"This is a private matter and when you ask this you lack respect and ethics," said the Bosnian. "The players will do as they wish and I would like to stop this controversy." Ramadan is mandatory for Muslims and one of the five pillars of Islam, although there are exemptions for the sick, pregnant, infirm or elderly. Individuals who are travelling or going to war are also permitted to avoid it and this is the provision under which most athletes will delay the fast until a more suitable time. It is an issue that Halilhodzic did not take kindly to being quizzed about, adding: "Ramadan is here and I read in some Algerian newspapers criticisms about me, about my image, about my honour. "They are trying to raise hatred against Vahid, against my family, and this is really disgusting. Germany midfielder Mesut Ozil has said he will not be observing Ramadan during the World Cup. "It is not the first time I have Muslim players in my team, I myself am a Muslim, and I've always left them totally free. This is a private issue - it has to do with private freedom of expression. "Those who continue criticising our team and my actions, I think it's shameful. But I will continue [as coach], I will continue working with this team. I'm sorry that you continue criticising what I do. "Stop asking me about Ramadan, otherwise I will get up and leave." Algeria captain Madjid Bougherra has indicated he will observe the holy month, but Germany midfielder Mesut Ozil and France defender Bacary Sagna have said they will not. 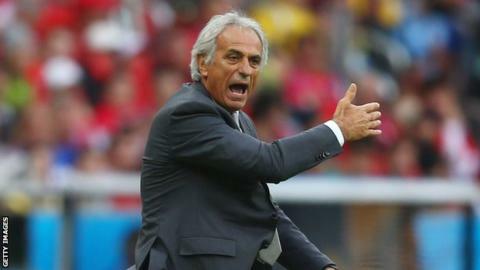 Halilhodzic's squad were accompanied to Brazil by Hakim Chalabi, a sports medicine specialist and one of Fifa's leading experts on fasting footballers.